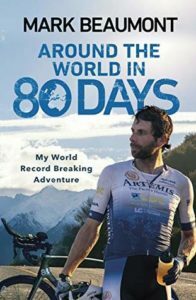 Before 2008 the record for cycling 18,000 miles stood at 276 days and 19 hours. Then Mark Beaumont smashed it by completing the same distance in a staggering 194 days and 17 hours. He managed this unsupported and had 30kg of equipment, clothing and camping gear on his bike. Since then he has cycled the length of the American and African continents, climbed the odd mountain and tried to row across an ocean. Since then various people had beaten his record and it stood at 123 days and 43 minutes set by the New Zealander Andrew Nicholson for his unsupported circumnavigation in 2015. After a few minor finance hiccups, with people stepping in to help ensure that he could do it. He began his journey at the Arc de Triomphe as he did all those years before. His route around the world would take him all across Eurasia, then Australia and New Zealand. From there he would head to America and Canada before arriving back in Europe for the final jaunt back to Paris. Not only was this a relentless physical journey, but he would suffer setbacks, accidents, low points and ache continuously. He would also see amazing sights and be lifted by the people who rode with him on his relentless schedule or who took the time to show that their support. It wouldn’t be much of a spoiler to say that he completed the challenge, there wouldn’t be a book if he hadn’t. He managed to obliterate the record for the second time in his life coming in 45 days faster with a new record of 78 days, 14 hours and 40 minutes. It is a stunning achievement for endurance cycling and to show the limits of human endurance, but this sort of achievement can really only be done with teams of support crew to enable him to cycle 240 miles in one day. I think that he can safely say that the record will be his for the foreseeable future. Not totally sure it is a travel book though as he is going so fast around the world that the human interaction that you’d get from a travel book really isn’t there. This is another really enjoyable book from Beaumont and if you have read his others then this should be on your reading list. Sounds like my kind of read although I’m not buying any more books for a while!! I thought I’d read one of his but apparently not. Will keep an eye out.